October is here and it is time for me to get my fall decorating done! It is now or never! 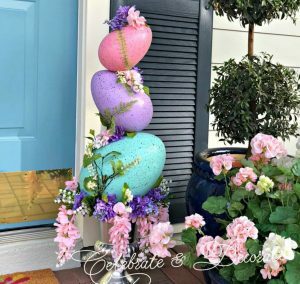 I really wanted to do something a little different around my front door this year. I wanted something full and lush to welcome guests to my home this fall. I started with 3 pieces of styrofoam that are about 2 inches deep by about 2 inches wide and almost thirty six inches long. After cutting my 3 strips of styrofoam, I needed to attach a hook to the top of 2 of the pieces and one to the middle of one of the strips. I need to make sure my hooks are secure, so I took half of a pipe cleaner and coiled it as shown above. 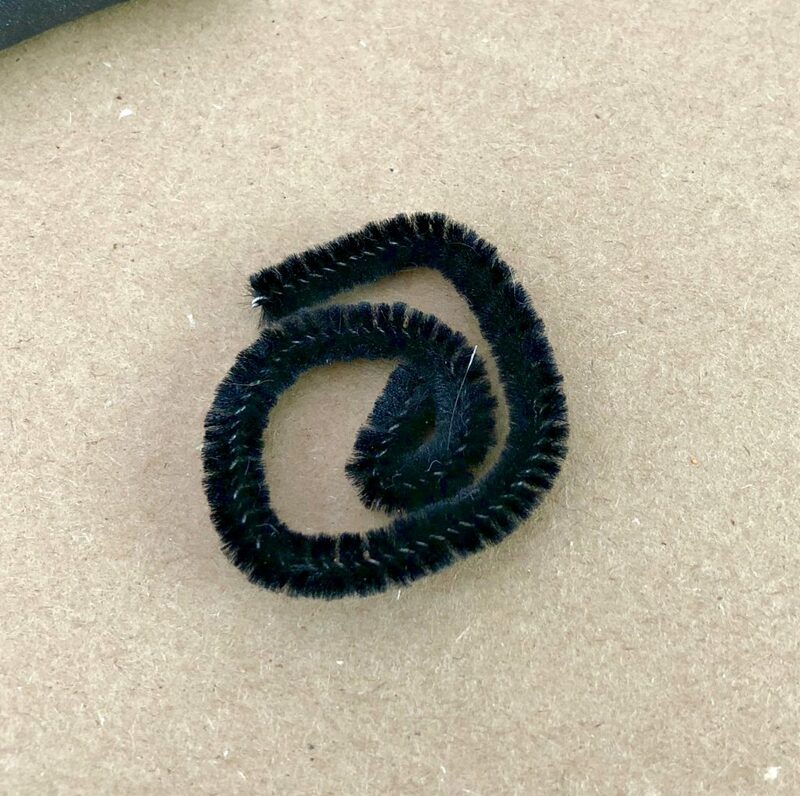 I bent a wire in half and pushed both ends through my coil (this will keep the wire from cutting through the foam). On the back side of my foam I used a button method to keep the wire from cutting through the foam. After pulling the wire through the button I twisted the two ends into a circle to use to hang my foam from a Command hook. 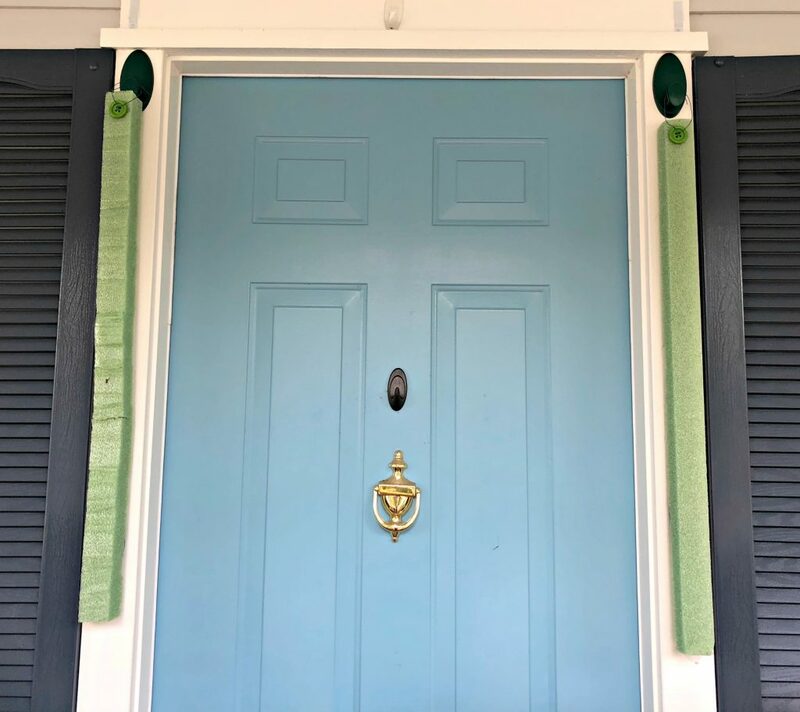 Here is how my two pieces of styrofoam look hanging on each side of my front door. Now it is time for the fun! 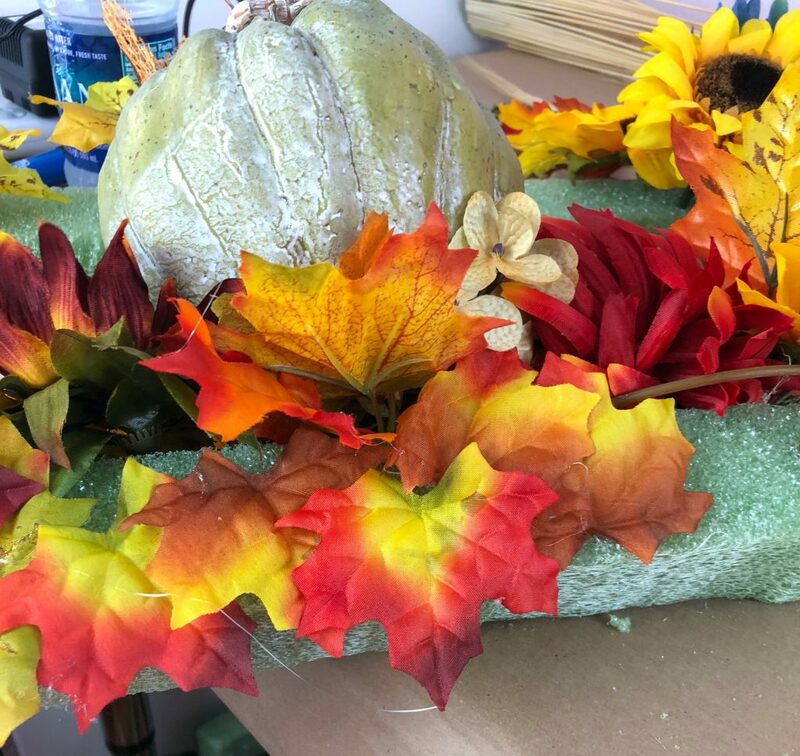 I just started adding my fall leaves and flowers sticking them into my foam. I kept the flowers and leaves coming out of the front of my foam. 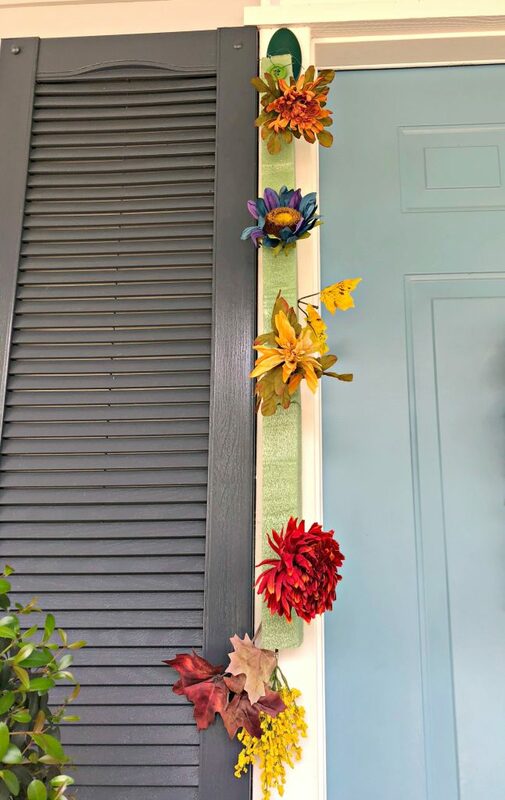 To keep my decorations narrow alongside my front door, I simply used low temperature hot glue and a package of Dollar Tree fall leaves to hide the edges of the styrofoam. 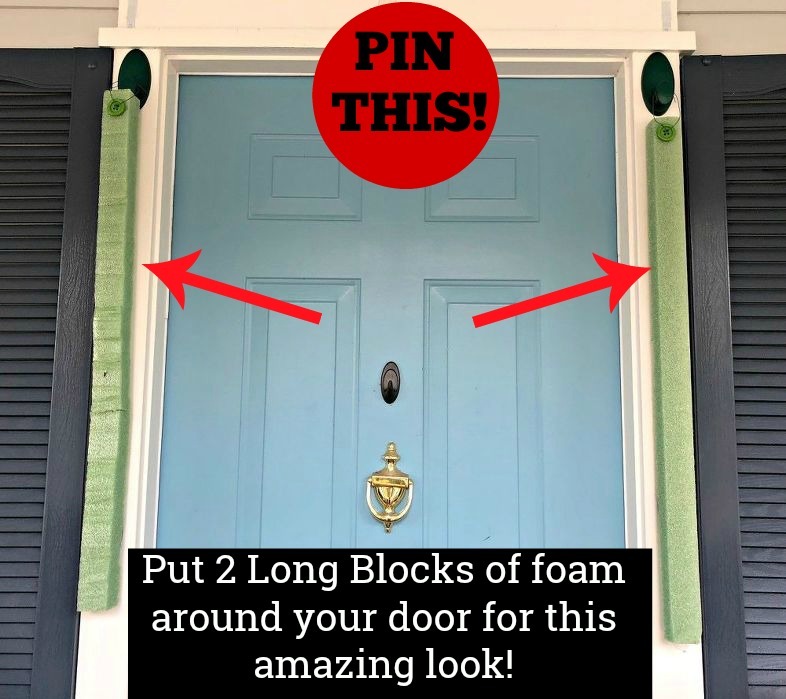 I repeated this process for each side of the front door and then for the third piece of foam for over the top of my front door. This is so full, much more so than the usual garland! I am ready to greet guests from now until Thanksgiving! This isn’t just for fall, use this same technique for any season or holiday! Love this but I don’t understand the pipe cleaner thing…. Thanks for adding the video link! It helped a lot! Thank you so much Jeanette! I am so happy with how it turned out! Last year we invested in new Andersen Exterior and Storm Doors. The glass has an E rating to reduce damage from the sun on these east facing windows. I want to resume hanging my Seasonal Festive wreaths, but can get any real answers about how to hang on these specially coated glass windows. I was hoping the 3M removable hooks would work, but can’t get any straight answers. (The Anderson representative in Manila had never heard of them…) What do you suggest? 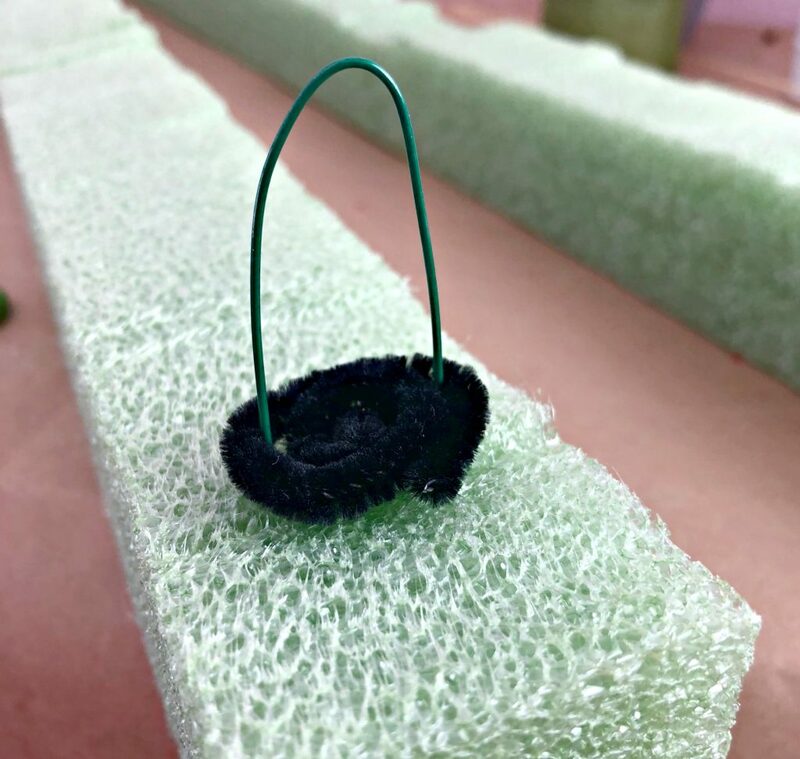 Have you tried one of the Command outdoor hooks? I don’t have those kind of windows, but I have had all kinds of success with them! Do you have glass in the door… there is a very strong magnet that you place one on the inside and the one on the outside has a hook on it… Very Very Strong,,, you almost need a screw drive to pry them apart. The stay on the window. Hi Jeri! I know about those magnets. I do’t have a glass door, so I just have a Command hook on my door! Sug, you just knocked another one out of the ballpark ! How very clever and festive for fall Chloe! Well done. What a great idea, Chloe! I love the full and lush autumn look. Thanks for sharing and Happy Friday! Thank you Pam, I really wanted something fuller than a garland this year! Nice job, Chloe. That looks great. You really have the most creative idea! WOW!! Love it!! Thank you so much Bird! What a great idea! I could see this concept being used for other seasons, too. Thank you, Joy, I will be using it for Christmas, too! Love it Chloe and I must say brilliant. It looks fabulous. Wow, that’s a statement and I love it! Very creative idea Chloe. Pinned to several boards. Simply those words: Lush, Rich and Beautiful. Beautiful idea, and I will am going to use it. I love it!! However I do have a couple questions. I see where you had the command hooks at the top on either side of the door, but how do you attach the bottom to hold in place and how did you hang the one above the door? I thought I would need to attach the side ones at the bottom, but they seem to be heavy enough they have not blown in the wind at all. You could attach a Command hook upside down below the styrofoam and make another wire hook attached to the bottom of each decoration and hook it onto the the upside down hook to secure it if needed. The one across the top of the door was hung with the same kind of hangers, one on each end with similar hooks in the ends of the top styrofoam. Love this! Could think of doing this for christmas too! Plastic ormanments, Or artifical fruit and greens. I used some double faced tape on the bottom to secure. Just a small piece seemed to do the trick. I will be doing something similar for Christmas myself! Beautiful! 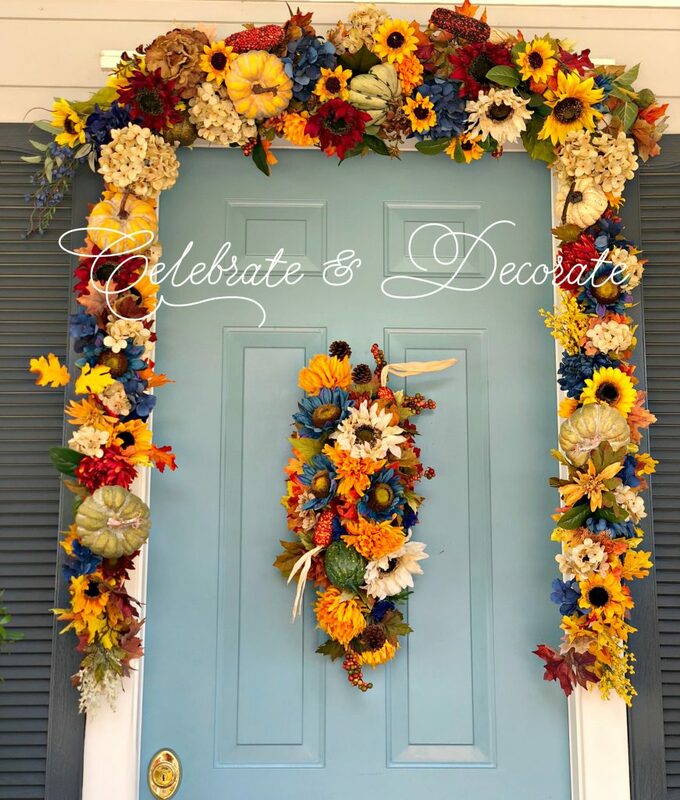 How did you make the center piece on the door? So very creative and pretty. Did you put leaves on both sides of the styrofoam or only one. And also, did you have to cut your styrofoam. I could not locate any strips the size you used. I put leaves on both sides. I just cut styrofoam from a big sheet. What kept the wind from ripping out the flowers and leaves off the styrofoam. Did you use low temp glue on each stem when you placed it. Beautiful!! Hi Shelia, I have had no trouble with the stems coming out of the styrofoam. I did not use glue on them at all. Thank you. This has to be the prettiest fall decorations I ever seen. Where did you buy your flowers especially the sunflowers? I have been hunting for similar ones and I can’t find them. Thank you so much Toni! 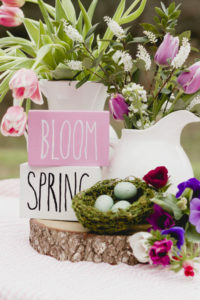 I bought the flowers at a variety of stores, Joann’s Hobby Lobby and Michael’s. 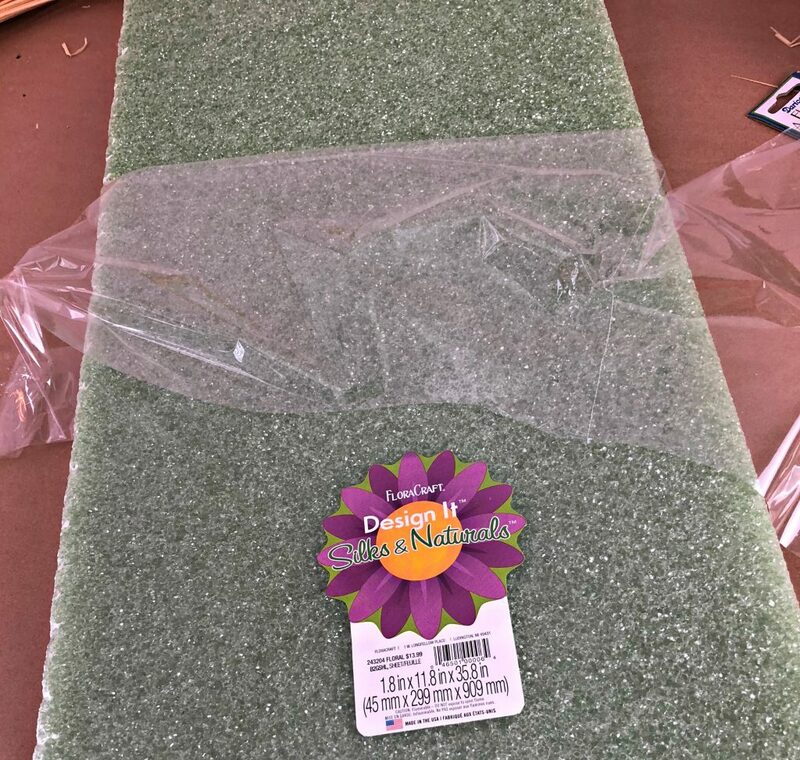 I think the sunflowers came from Joann’s. Thank you so much Rozie! I am glad you liked it! 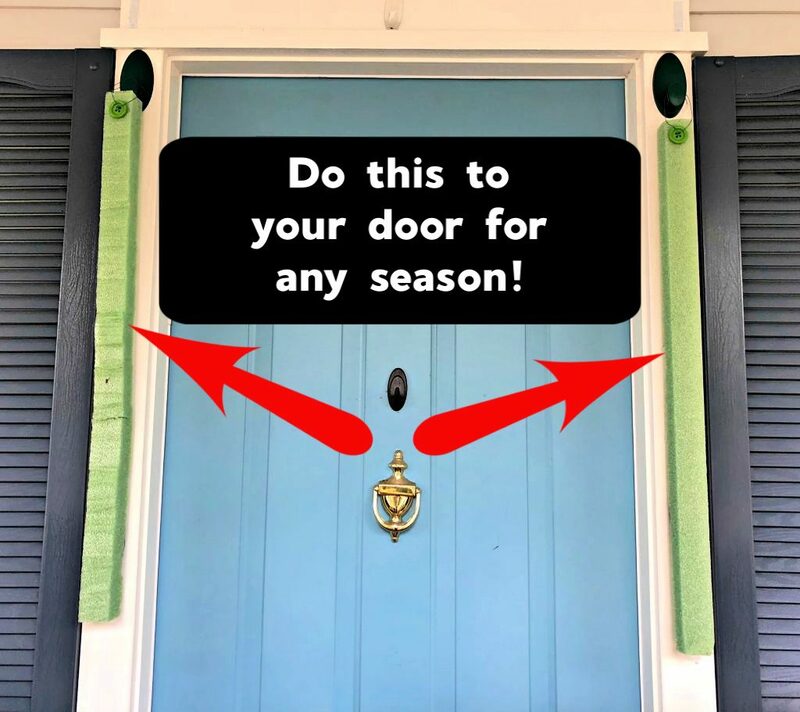 Thank you Cheryl, yes, this is an easy to adapt method of making full decor around your front door! This is really beautiful. Does anyone else have the problem with flowers on or around the door attracting bugs and birds? I don’t seem to attract any bugs or birds with my outdoor decor. You could pull this down at the end of November and store it for next year! I love this idea and you hit a grand slam! Kudos and keep it up. We love it! Thank you so much Deborah! It is staying up for Thanksgiving at my house! Then it will be full time Christmas! Love the look, it’s so beautiful, also what colour is Yr front door? It’s a lovely shade of blue, not sure I could get in Ireland?. I don’t know the exact color name. It is from Benjamin Moore, I am sure you could find a similar color or have it mixed. Are you going to do one for Christmas? So much better than lighted Christmas garland for daytime! I’m guessing that lights could be added for night? I really used up silks I had around my house, I would say that each of the 3 pieces, one on each side and the one across the top would probably run about $30 each if you had none of the items on hand. I do love the artificial fall leaves from Dollar Tree! 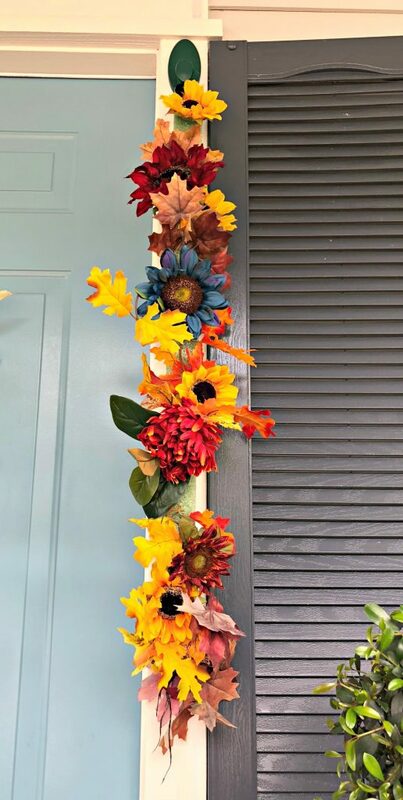 How did you do the top part of the garland? I made the top part in the same way with a piece of styrofoam across the top, secured on each end by a circle of wire and then a Command hook on my house. I will be doing something similar for Christmas! Chloe, Thank you for sharing this. Best creative idea I’ve ever seen that is both relatively easy to do & very attractive. It looks like fun to make & then can be stored for next year! You do have impressive skills. Hope to see your Christmas one. Thank again. Thank you so much Leah, I will be doing something similar for Christmas! Stay tuned! Love this! Thank you for sharing. I am going to use the foam idea for a Christmas door surround. I will send you a photo when I finish putting it up the weekend after Thanksgiving. 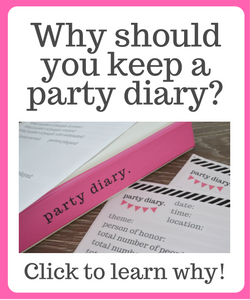 Thank you so much for sharing this great idea! It’s beautiful. Is it expensive to get all of that decorations or did u get it in bulk? Thank you so much Jennifer. I actually used a lot of leftover pieces I had in bins. I buy most of my things from Joann’s, Hobby Lobby and Michael’s. Where did you find the long pieces of styrofoam? I just cut it from a large sheet of styrofoam! Easy as can be! Very pretty! I really like the blue flowers. 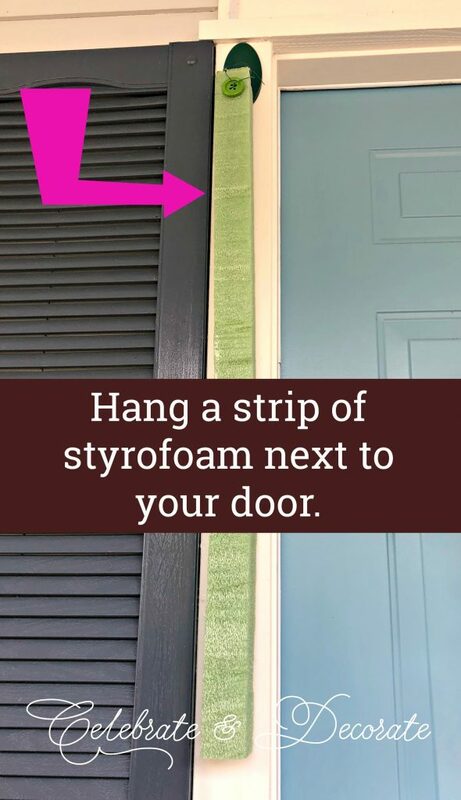 They make it “pop”, and look great with your door color. 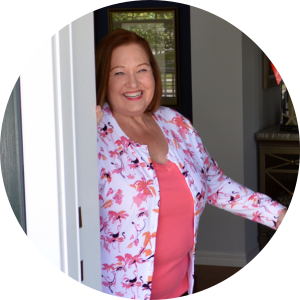 Thank you so much Linda, I really wanted to coordinate the fall look with the house and the blue did the trick! I have a very small space, for my condo door. For years, I was able to hang lighted garlands, etc. around a door where I previously lived. It seems the styro strips can really be customized, according to space concerns. So tickled this problem is now solved! I plan to make a gorgeous Valentine display, albeit with just one strip. I am so glad you found this and I hope that it will work for you for your Valentine’s display! Thanks for letting me know! !